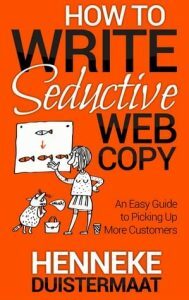 How to Write Seductive Web Copy by Henneke Duistermaat is a book on copy-writing for small business owners or freelancers. How to Write Seductive Web Copy is short and to the point, divided in 6 easy sections. Henneke says that the biggest mistake writers do is trying to write for everyone. When you try to everyone, you’re really not writing for anyone. The second mistake, she says, is to write what you want to write instead of what people want to read. I don’t agree with that second part. I think that by being authentic you naturally attract the readers that vibe and like your personality. Which allows you to be yourself and write what you love while you still write for someone: those are are like you (or want to be like you). Instead, says Henneke, you should write for your ideal reader. If you don’t have one, it’s time to sit down and come up with your ideal reader. People are not interested in you. And not even in your products. They are interested in what you or your product can do for them. Features and specifications are dull. Talk about the befits for them instead and the problem you solve. The author says that even benefits can be dull and she asks whether problems to avoid are more powerful than benefits and pleasure to gain. She says that depends on your audience and you need to test it. The value proposition is what you put under the headline in bullet points. Henneke says that the bullet points need to be credible, concise and clear. And they all need to follow the same structure (ie. : if the first is one line, then you should try to make all the other bullets fit in one single line). Everything should support your selling efforts on your website. Even your about page is not really about you, it’s about what’s relevant for your customers. I liked the idea Henneke introduce of “making people nod” with your copy. Would you like to have a loving life partner? Each of your page should have a standout call to action. In different colors, or in bigger letters. Use short paragraphs, with four sentences maximum. Read your copy again and cut all the unnecessary and redundant information. If an adjective or a word doesn’t add value, remove it. Especially, eliminate all superlative. Let the reviewers laud you, don’t do it yourself. If you are not yet sure who your ideal reader is, you can check Amazon reviews for products in your category. Reading who they are and what they liked about the product can help you come up with the ideal reader (note though that many reviews are fake, as many authors launching books have teams for piloted reviews). Don’t make your testimonials too over the top sugary or they’ll lose credibility. Captions are one of those “highly read” bits of information in your copy. Use it! How to Write Seductive Web Copy is short and to the point and with lots of great tips I have taken away from it. However maybe I wished it were a bit longer. How to Write Seductive Web Copy was a really good read for me. It’s mostly for freelancers and small businesses who have a 3-4 pages website, but I could still take a bunch of great nuggets of wisdom out of it. As a result of this book, I edited a few of my products and I believe that both the products, and my knowledge, have improved. Therefore, I can recommend How to Write Seductive Copy.